Friday Follower Freebie! Old School Revlon! 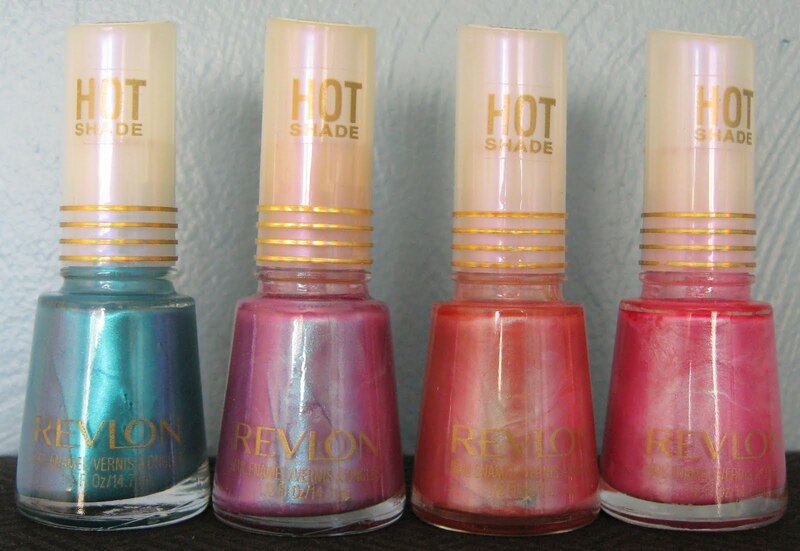 Well, I used to have a couple of these old Revlon shades, and decided in one of my off moods that I didn't need them any more. Fast forward to the present, and I decided I did indeed need to have them again! Typical Gemini. The two shades I had previously, Magical and Crystal Ball (first 2 from left), have just enough duo chrome to make them very interesting. 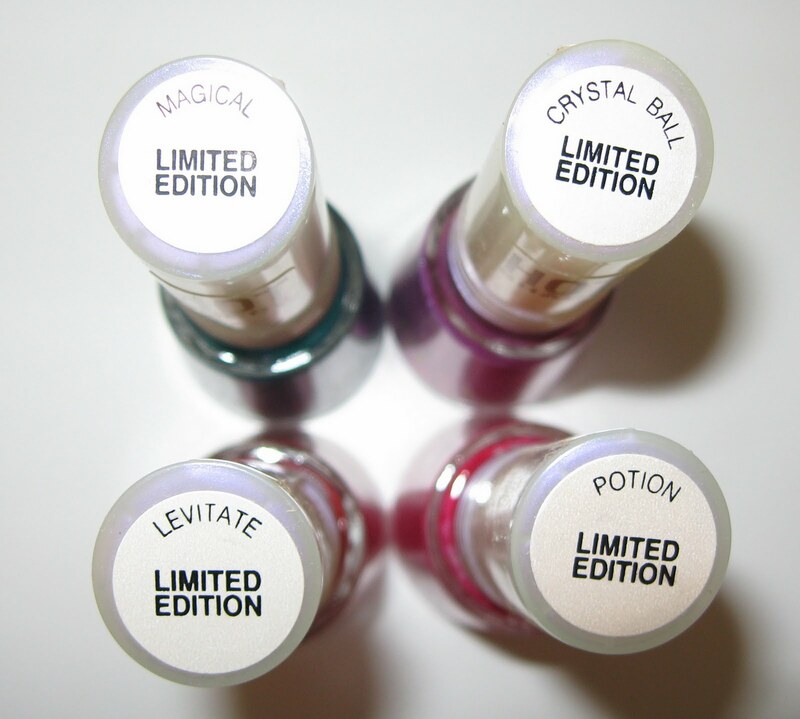 I've not used the other 2 shades (Levitate, Potion), so I'm not certain if they have that hint of duo chrome. Long story short--I saw these on eBay and ordered them. I didn't pay attention to the wording of the auction, but it was for a set of not 1, but 2 of each color. They were only $1.49 per shade set, so that was a good deal even for 1 shade. What to do with the extras? You guessed it! Giveaway!!! Below: I only swatched one for this post, but it's my personal favorite. Magical is magical. No Doubt. Micro shimmer, a perfect turquoise shade, and just enough purple duo chrome to make any duo chrome lover's heart palpitate. Please forgive me, Magical. I never should have let you go! You must know how this works by now, don't you?!! If you'd like to win all 4 of these shades, just leave your eMail in the comments section--and you can comment too if you like! I'll leave the entry period open until I post my Come Monday newsletter Monday morning. The winner will be announced at that time. Woah, even just in the bottle, Crystal Ball looks phenomenal! holy wow, those are amazing looking! They all look really nice, great giveaway. these are so pretty, i'm crossing my fingers! Love the magical... certainly a must try!!! *gasps* enter me pgreenlee@wi.rr.com.. have a great weekend! These are very cool :) Love Magical! Those shades are to die for! I definitely want to enter for these! OMG. I've never seen these but they look frigging amazing! I love the swatches you've made, it looks really really really pretty. Great giveaway :) Magical is such a pretty blue!!!!!!! wowww what a great nailpolish would like to enter this.. Thanks Mary! Another great giveaway! OMG those are so fricking gorgeous. LOVE these colors! Awesome giveaway! A girl can never have too much nail polish, right?! Please enter me!! My email is leena.k.nguyen@gmail.com! Holey Moley those look great! loving the old school colors! 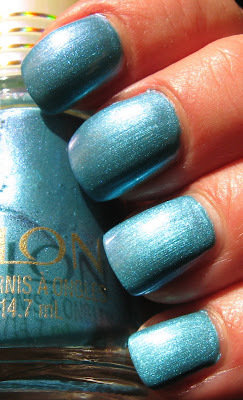 Love Revlon polish! It was the first polish I used so many years ago. These must've come out when I was in my no polish look years. How could I ever have done that? Thanks and Merry Christmas Mary. Oh wow these are the OG's of the duochrome world huh? =D email is polishfreshie at aol dot com. Thanks for the chance to win this giveaway, Mary! Thank you very much for this great opportunity. That blue is really pretty! Wow~ Magical is very pretty~! I´d like to enter the giveaway!!! It is so much more fun to have a giveaway with hard to find colors! Magical is beautiful! I'd love to see Crystal Ball, too. It has the word "duochrome" in it. Wow they're such pretty colours - they look quite thin in the bottle, but they seem to come out fairly opaque on the nail, would love to try them! UHHH-Mazing! You always find the best things! Love the idea of old school polishes. I knew nothing about them when they were around :) Thanks, Mary. Ooh, lovely! I'll have my fingers crossed! Thank you. Eeeee, thank you! This is an awesome giveaway! bookworm396 at gmail dot com. Hey! Thanks for the giveaway opportunity. Oh! Where was I? That's right... Entering this terrific giveaway. I am a public follower as Ice Queen. I love your old school posts the best and especially love having the opportunity to win some old school polishes! Thanks! Oooh, those are pretty! Thanks for the giveaway! Wow, so pretty. I don't think I remember seeing these in stores. Thanks for making a generous mistake. Those polishes are so pretty! 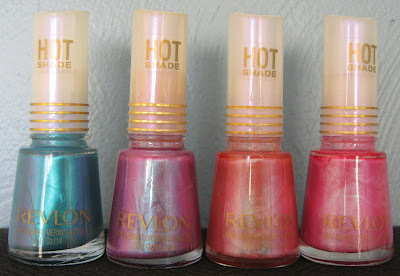 Maybe Revlon should start selling them again haha. Those are so pretty! cherylcherylcheryl at gmail dot com. I've been wanting Magical for awhile now. If I don't win I'm definitely going to buy it eventually! Beautiful! I've never seen these before. Wow these are very interesting shades! 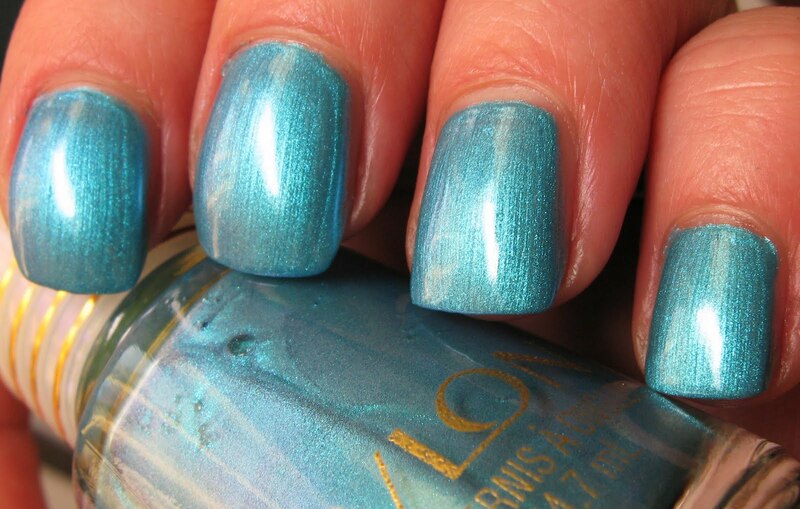 Wow, that turquoise looks amazing! Turquoise is my favorite polish color. Please pick me! ooo pretty. I love magical and crystal looks like it might be something I'd love too. These colors are so amazing!! phew~ entered before the monday newsletter. I missed the giveaway but would love to see all 4 of these colors swatched. Thanks!